I met Salvatore Ferragamo during the week and heard from him that Mr. Bernard Oswell, one of the most knowledgeable men in the English shoe world, has taken charge of what will here be called “FERRINA” shoes and which are now being made in Norwich, Northampton and London, the three English centres of shoemaking. Since February the men have been getting into the technique of combining the delicate designs with great wearing strength. “We have learnt to draw the leather over the last until you might say that it corsets it,” as one worker said. 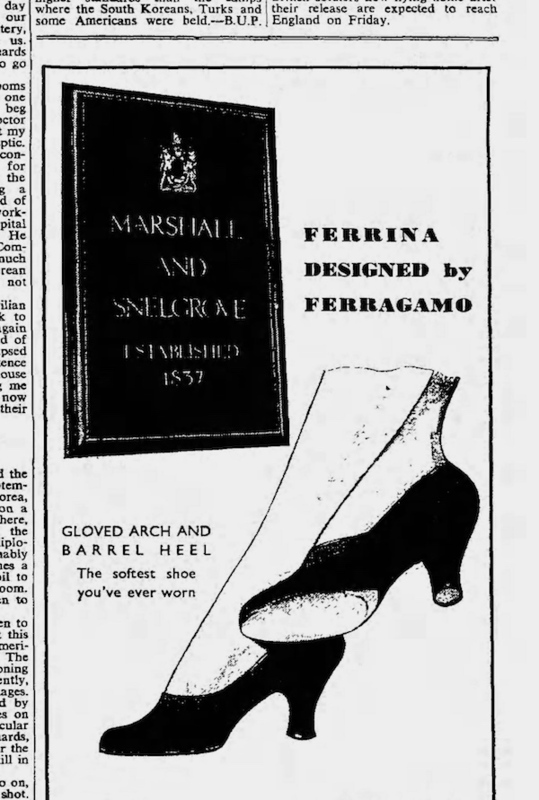 The FERRINA brand was patented by Salvatore Ferragamo in Italy July 14, 1949 (granted March 27, 1950) to manufacture general women’s and kid’s shoes. The inventor of the wedge heel for women’s shoes, Signor Salvatore Ferragamo of Florence, gave a demonstration yesterday in Manchester of the machine-made shoes being made in Britain now to the exact design of the hand-made shoes he produces in Florence. The dream of the industrialised hand-made footwear theorised at the end of the Twenties was gone forever and Ferragamo went for a strict quality controlled machine-made production. 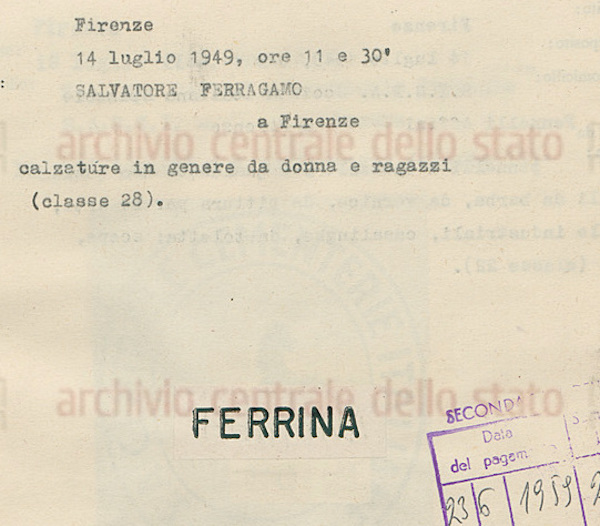 The “exact design” was really that, as the ad above can prove: the well known patented model “Gloved Arch” (upcoming) shown as part of the Ferrina line. Which means the Ferrina weren’t really HIS shoes but apparently deemed good enough to fulfil the requests coming from both European and American markets. The British machine-made shoes will mostly sell at £ 6, which is about half the price of the Italian hand-made originals, and it is intended to export them to America as well from the factories in Norwich (the largest), London, and Northampton, which are making them. They are being made from British materials - leather from Bolton for instance - which Signor Ferragamo imports to Florence for his hand-made designs. 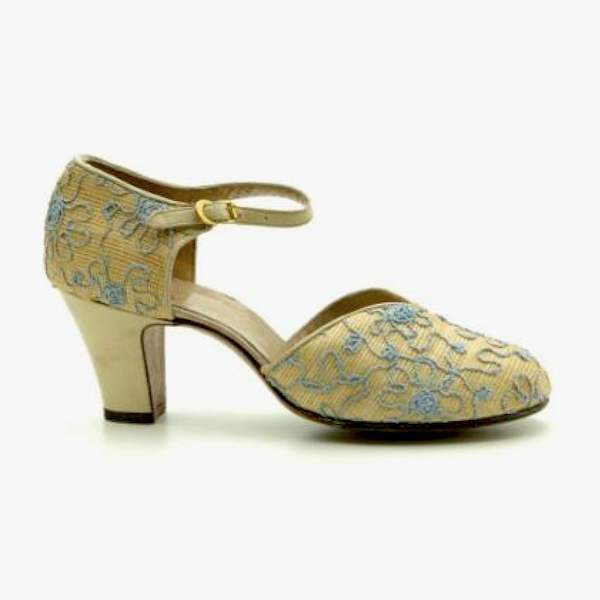 The shoes are made on special machines, as they belong to that minority of shoes which, for instance, have left and right heels differently shaped, and also to accord with Signor Ferragamo’s principle that the weight of the body should fall vertically on the arch of the foot. The arch joint, he says, never exceeds 1 1/2 inch in even the largest feet, and if this is not well fitted to the arch of the shoe even shoes made to measure will not fit entirely well. One demonstration of this principle could yesterday be seen in light sandals with a “sculptured wedge” heel cut completely away beneath the heel itself and depending on a small moulded wedge projecting backwards below the arch of the foot. 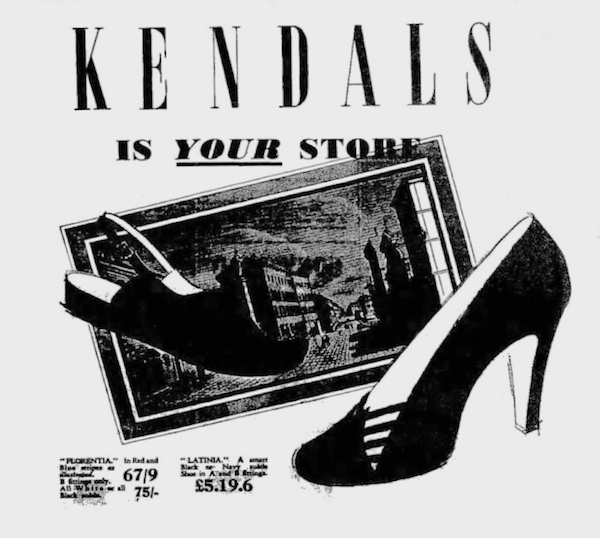 This display, held at Messrs Kendal Milne And Co., also included, apart from many classic designs, coloured summer shoes in Manila hemp, and “gondola” sandals in a lower price range, with sling back, wedge heel, and turned up toes.